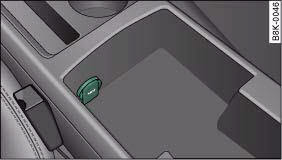 – Open the cover of the front ashtray. – Press in the cigarette lighter knob. – Wait for the lighter to spring out. – Pull out the cigarette lighter immediately. – Use the glowing heater element of the cigarette lighter to light your cigarette. – Put the cigarette lighter back in its socket. – Take out the cigarette lighter. 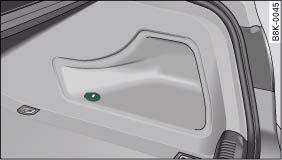 – Insert the plug of the electrical appliance into the cigarette lighter socket. 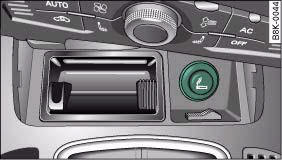 The cigarette lighter employs a standard 12 Volt socket which can also be used as a power source for electrical appliances. The appliances connected to the socket must not exceed a power rating of 100 W.
The cigarette lighter only works when the ignition is on. • Take care when using the cigarette lighter. Carelessness or negligence when using the cigarette lighter can cause burns. • The electrical sockets and any appliances connected to them will operate only when the ignition is switched on. Improper use of the electrical sockets or the appliances connected to them can cause injuries or fire. To avoid the risk of injury, never leave children unsupervised in the vehicle with the key. • Always use the correct type of plugs to avoid damaging the sockets. • The cigarette lighter socket should only be used for a short period of time as a power source for electrical equipment. Please use the electrical sockets* in the vehicle when connecting equipment for longer periods. Using electrical appliances with the engine switched off will drain the battery. Electrical equipment can be connected to both 12 Volt sockets. – Open the cover cap concealing the socket ⇒ fig. 98. – Insert the plug of the electrical appliance into the socket. – Fold up the lid, fig. 100 to access the socket. Electrical equipment can be connected to the 12 Volt socket. The appliances connected to the socket must not exceed a power rating of 150 W.
The electrical sockets and any appliances connected to them will operate only when the ignition is switched on. Improper use of the electrical sockets or the appliances connected to them can cause injuries or fire. To avoid the risk of injury, never leave children unsupervised in the vehicle with the key. • To avoid damage to the vehicle's electrical system, never connect equipment that generates electrical current, such as a solar panel or battery charger, to the 12 Volt sockets or cigarette lighter in order to charge the vehicle's battery. • Use only equipment which has been tested for electromagnetic compatibility in compliance with EC Directive 2004/104/EC.